In this post, students explored takadimi through singing, playing, composing, inner hearing, partwork, reading, and writing. The beauty is that the whole time, the process felt like fun and games. This “child’s play” approach is what makes the learning process so special. Now, students may be ready to learn the real name of four sixteenth notes on one beat. Keep reading to find a presentation test, presentation plan, and why I choose “takadimi” over other rhythm syllable systems. This presentation plan comes from the material in the Planning Binder. If you haven’t checked it out yet, you can take a look here. When we look at data from the earlier preparation activities, combined with a presentation test, we get a good sense of whether or not that child is ready to move on to learning the real name for four sixteenth notes on one beat. If your data shows that students can aurally identify this rhythm in a song, you are ready to move on! Here is a clip video from the Planning Binder where I explain how I present takadimi. You can find the full takadimi concept plan there, along with plenty of other teaching plans and strategies. Watch the video to see my step-by-step process for teaching takadimi! What rhythm syllable system should you use? The bottom line is, use something you’re comfortable with and your students will be successful. That said, there are numerous rhythm syllable names used by music teachers, such as metric counting, the Kodaly rhythm syllables, Gordon syllables, and takadimi syllables. I choose “takadimi” for this grade-level. Here are three reasons why. Simply put, I think this is easier to say. I find myself getting tongue-tied using the Gordon system, and if I struggle with it, how successful can I expect my young students to be? From this perspective, if I didn’t use takadimi I would use tika-tika. One of the strengths of metric counting is that it assigns a meter grouping to each beat. However, in early grades my students don’t yet know all the meters we use in class, including 3/4 and 5/4. Counting metrically would involve information that is unnecessary and even confusing for this developmental level. In takadimi, each beat has a subdivision, but the measures themselves can be written without a meter. That makes it the winner for my classroom in early grades. I switch students to metric counting around 5th grade when I think they have enough background knowledge of beat, rhythm, and meter to justify it. Any rhythm system - Gordon, Kodaly, Takadimi, or metric counting - gets to the same end result which is ultimately that students love, understand, and create music. With a solid understanding of how four sixteenth notes sound, combined with the new knowledge of how they look, we are ready to move on to my favorite phase - the practice phase. The first time I watched an Orff and Kodaly-inspired classroom, I was shocked to see students working with 16th notes at what I considered to be a young age (around 2nd or 3rd grades). I was used to a band approach where students learn longer note values like dotted half notes and whole notes before subdividing to 16th notes. What I have observed since then is that rhythms with extended sounds are much more successful if students know how to subdivide to smaller increments beforehand. Their listening skills improve, and they have enough experience with 16th notes to help them stay more in time through longer note values. With that in mind, here are some of my favorite ways to prepare 16th notes with 2nd and 3rd graders! The songs referenced come from this blog post about songs to teach 16th notes. Students should have plenty of experience with these songs before moving onto mid preparation activities. Child’s play is the first step in any preparation sequence. At this point, students are not asked to do anything with this musical knowledge. They are simply interacting with it through play-based activities. This part of the process really feels like “fun and games” because that’s exactly what it is! However, even though it truly is just “game time”, be sure not to rush this step. Through this process students are developing critical musical vocabulary and understanding that they will need to draw upon later. Here are some ideas that you use to help students think about the musical content of the song. They also add some variety as you play the games or do the songs’ activities. Use these ideas with any of your 16th note repertoire, but they work especially well with the songs from this post, including Chattanooga Choo Choo, Dinah, Paw Paw Patch, Tideo, and the refrain to Built My Lady a Fine Brick House. Clapping the words to the song while a few students play the beat on tubanos or another classroom instrument. Singing on a neutral syllable, such as loo or la”. Clapping only one word or one group of words. This works best if the special word has some connection to 16th notes. For example, only clap the word “Chattanooga” in Chattanooga Choo Choo. Play the game or do the activity while counting how many times you sing, “Chattanooga”, “no one’s in the”, “pretty little”, “jingle at the”, or “swing a lady” (the 16th notes in the song). You can find the whole list of preparation activities in the takadimi concept plan in The Planning Binder. After experiencing 16th notes through play, students are ready to notice four sounds on one beat. But that doesn’t mean the fun stops! For this example, we’ll use the song, Chattanooga Choo Choo. As students play, they should inner hear the song, or, “let the instruments sing the song”. Through some carefully worded questions, students discover 4 sounds on a beat. After students play instruments or body percussion, have them keep a steady beat while they sing the first eight beats of the B section. From there, students help the teacher figure out all the rhythms they know in those 4 beats. Starting at the last beat, ask students how many sounds they heard (2). Review that right now two sounds on a beat are eighth notes, and when we see them we say “ta-di”. How many sounds did they hear on the first beat? (1) Review that right now one sound on a beat is a ta, and the real name of ta is a quarter note. How many sounds did they hear on beat three? (4) Students notice that we don’t have a name for four sounds on one beat yet. 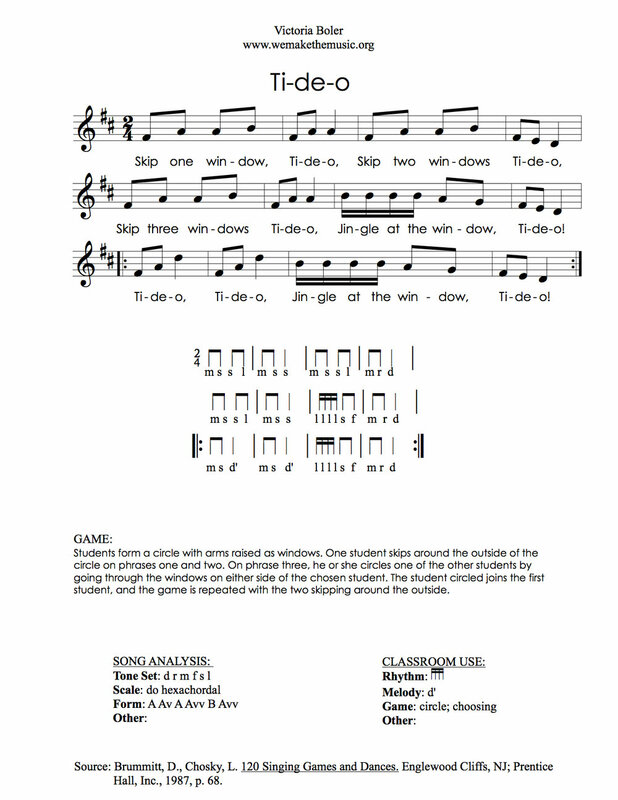 Ask students to help you write down what they hear in a variety of known songs. Start by writing down rhythms you know, then when you get to the 16th notes students may vote on how they should be written. Some examples might include dots, smiley faces, or stars. The last preparation idea comes from the Planning Binder. With song fragments, ask students to recreate the rhythm of Chattanooga Choo Choo. This can be done individually, but I recommend doing it in small groups of two or three students. After checking that their notation is correct, students may create a new card order for the song. Instead of performing their arrangements in small groups (which students might not be ready to do yet), the teacher will clap a single group’s pattern. Every group of students listens to see if theirs is the pattern being performed. Through these activities students will have experienced takadimi through singing, playing, composing, inner hearing, partwork, reading, and writing. The beauty is that the whole time, the process felt like fun and games. The next post will cover how to know if students are ready to learn the real name of four sounds on a beat, and give a presentation plan to follow.